Way back in February, I was about to make some gingerbread granola. I probably stumbled across a recipe online and figured, of course, gingerbread granola is a thing! But I was out of molasses and made do with something else. But when I found myself one Saturday morning in the kitchen putting together some granola, the idea of gingerbread granola came back into my head. All that cozy spiciness that you associate with gingerbread can be poured into your morning bowl. It’s a very nice thing to look forward to on these dark autumn mornings. 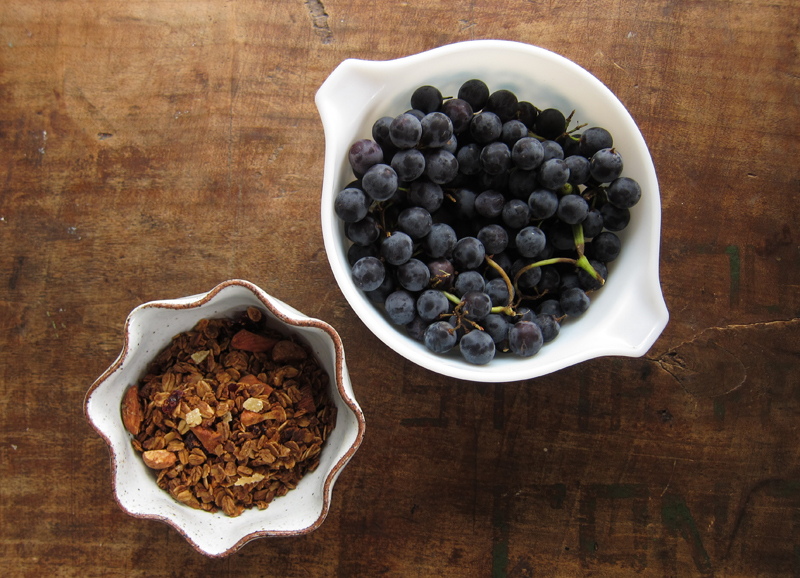 Molasses give this granola a dark, deep flavour. Maple syrup goes along for the ride, but don’t go thinking that this is a sweet, sugary breakfast cereal. It’s not. I like this dark and robust. It goes well with my morning coffee and since I usually eat granola with coconut yogurt and loads of fresh fruit (strawberries and Coronation grapes this time around) I don’t see the need for extra sweetness. But please do feel free to add in more maple syrup if you’ve got a sweet tooth. The key is not to just have molasses on hand, but to load up on the ginger. Ginger is key, obviously. So there’s a tablespoon of ground ginger that mingles nicely with the rest of the spices: cloves, cinnamon and nutmeg. But the candied ginger that gets sprinkled over top when the granola comes out of the oven is essential. Don’t skip this, please. It adds the pop to this gingerbread breakfast. In a large mixing bowl, use your clean hands to combine the oats, wheat germ, almonds, spices and salt together. Measure the coconut oil into a measuring cup and then pour in the molasses – this helps the thick molasses to slide out easily. Add in the maple syrup. Use a wooden spoon to give everything a good stir. Evenly divide the oats onto 2 trays and bake, stirring every 15 minutes or so until evenly done – about 25 minutes in the oven should do it. When the trays come out of the oven, scatter the dried cranberries and ginger over top. Let the mixture completely cool before storing in tightly sealed jars. The candied ginger is what would make this a major win for me…I can’t get enough of the stuff! This looks really good! I love anything gingerbread spiced! 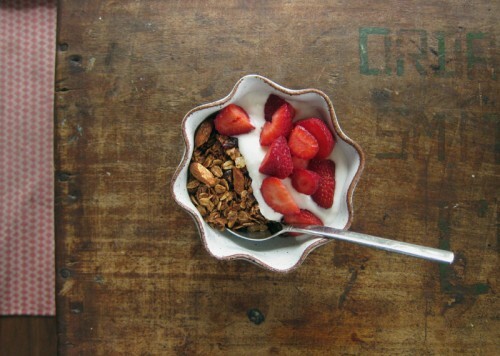 I am quite certain that I could live off of only yogurt, fruit, and granola and be a relatively content person. It is one of my favorite things, and definitely one of my top breakfast meals. 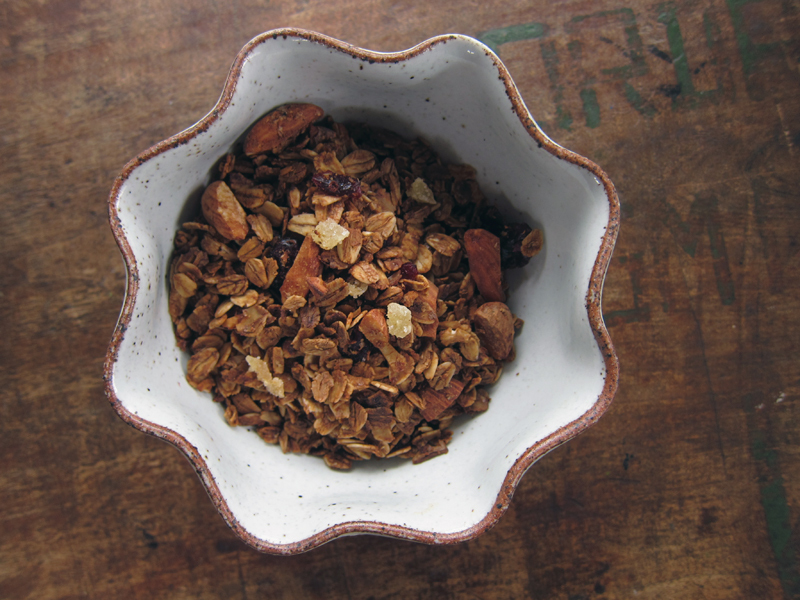 This granola sounds spicy and flavorful, and perfect for Fall. I bet it makes the kitchen smell fantastic while it’s baking too! I made a new batch of granola last night, if only I’d seen this first! It sounds perfect and just what I need to get me out of my granola rut. I love the idea of gingerbread flavours, and all those warming spices. Just right for the changing season. I am a huge ginger fan and this just sounds divine! Yum! Will have to try for sure. Joanne, it’s so great with all the ginger – I’m sure you’d love it. Amanda, sometimes I think that too! A great combo. Kasey, gingerbread + granola makes breakfast better. mmmm! I made a hug batch of granola at work yesterday for the new brunch menu the hotel I work at is launching. Not nearly as aromatic as this one though. If I had seen this recipe sooner, I would have recommended it to the head chef. Who doesn’t like the aroma of gingerbread!? I am a teacher and every Sunday night I make up a batch of granola as I make my lesson plans for the week. More often than not I turn to your blog for recipes and inspiration. 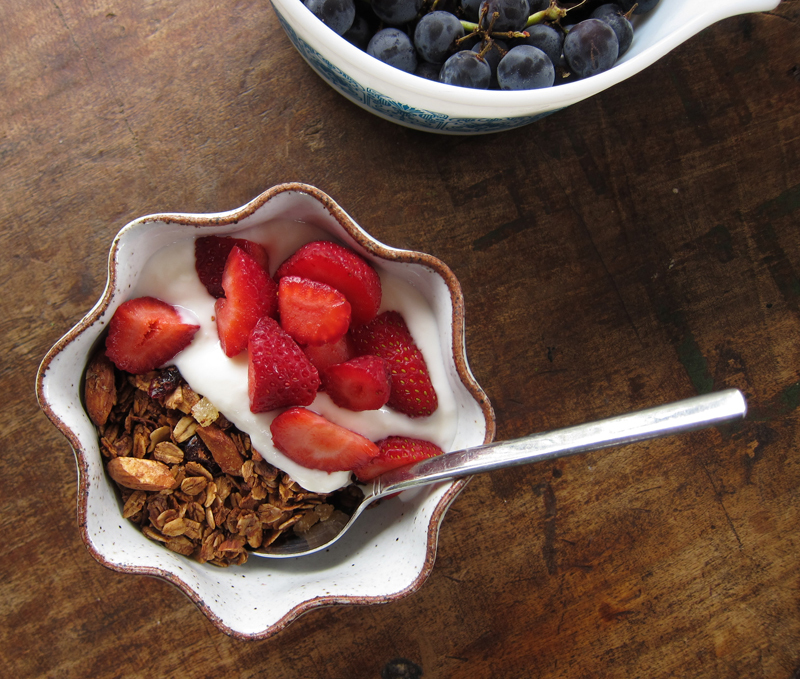 If you put together a collection of granola recipes, I’d be in line to buy it! This one is really delicious, and I went to make it for a second time, but found myself out of too many spices, so I tore open a couple of chai teabags and used them instead and it turned out great- the pepper really added to the gingerbreadiness. Please keep all the delicious recipes coming! Sunny, glad you liked this. And throwing in the seeds is always a good move. Lisa, aw, thank you! I’m thrilled at your comment – hmmm, maybe I will do a granola cookbook one day 🙂 Love your adaption on adding in the chai tea bags! Will have to try it myself soon. Thank you so much for sharing your recipe! Made that today and it is yummy! It pass the fussy kid test. I didn’t have maple syrup so substituted with honey. Very tasty. Finally made this, and it is SO good! !